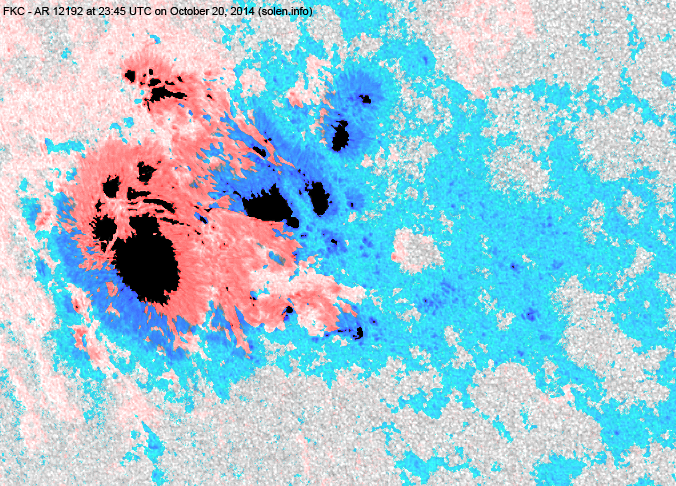 Last major update issued on October 22, 2014 at 05:45 UTC. Updates will be irregular until October 27. 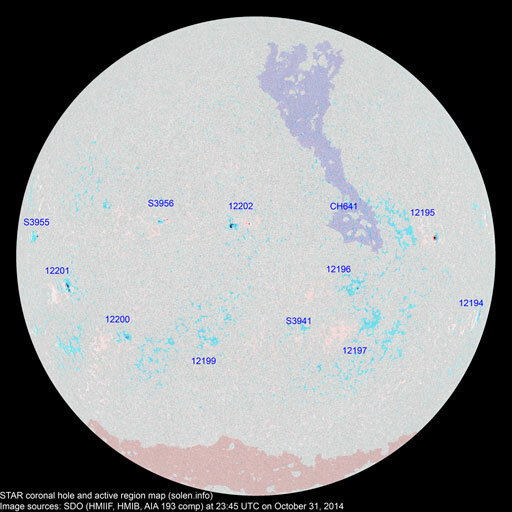 The geomagnetic field was quiet to active on October 21. 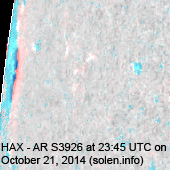 Solar wind speed at SOHO ranged between 531 and 749 km/s under the influence of a high speed stream. 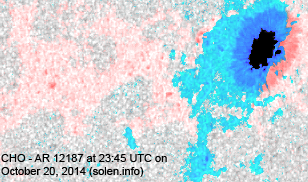 Solar flux at 20h UTC on 2.8 GHz was 199 (increasing 54.3 over the last solar rotation). 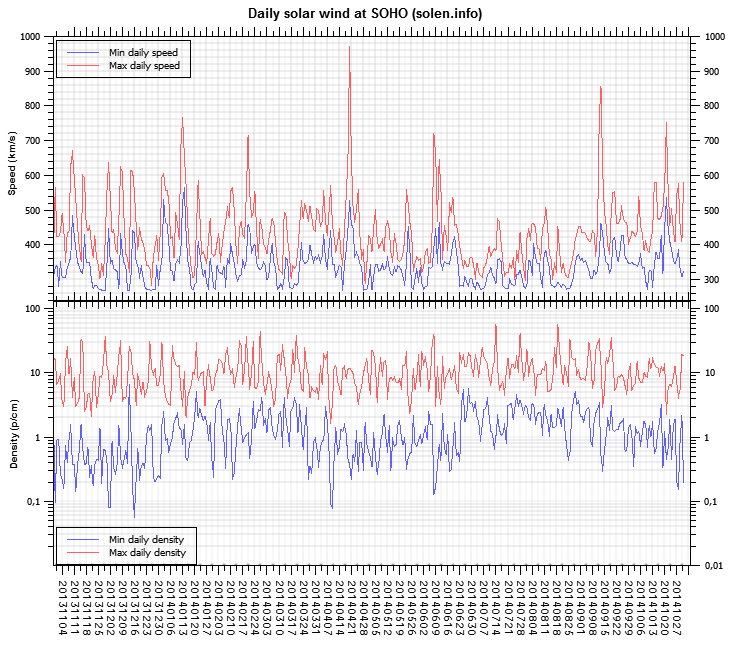 The 90 day 10.7 flux at 1 AU was 137.3. 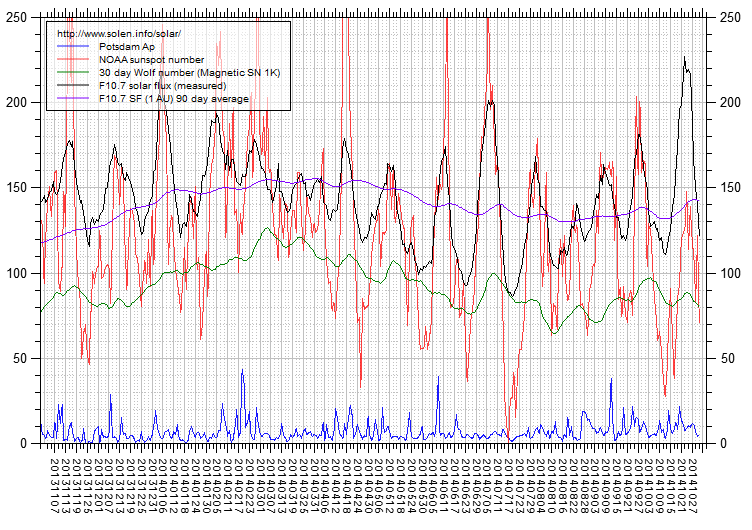 The Potsdam WDC planetary A index was 14 (STAR Ap - based on the mean of three hour interval ap indices: 13.8). 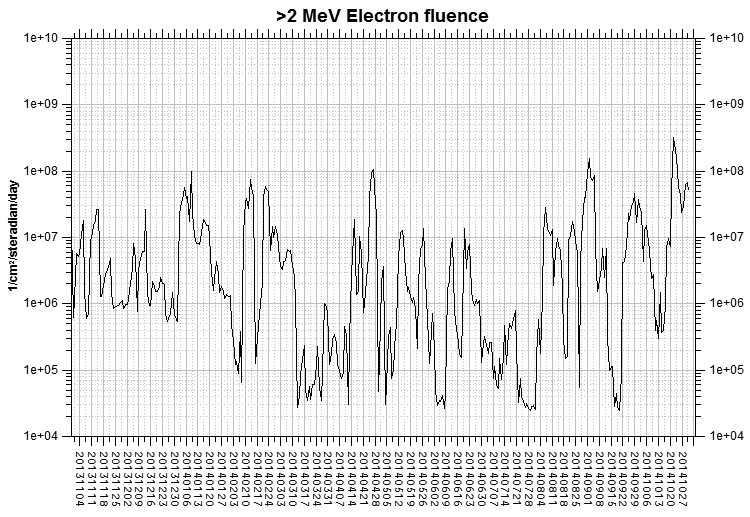 Three hour interval K indices: 32323343 (planetary), 22333332 (Boulder). 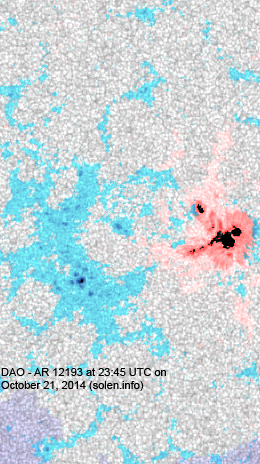 At the time of counting spots (see image time), spots were observed in 9 active regions using 2K resolution (SN: 285) and 9 active regions using 1K resolution (SN: 182) SDO images on the visible solar disk. 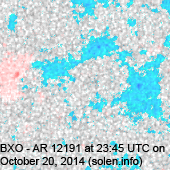 Region 12187 [S09W54] was quiet and stable. 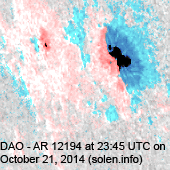 Region 12191 [S12W38] was quiet and stable. 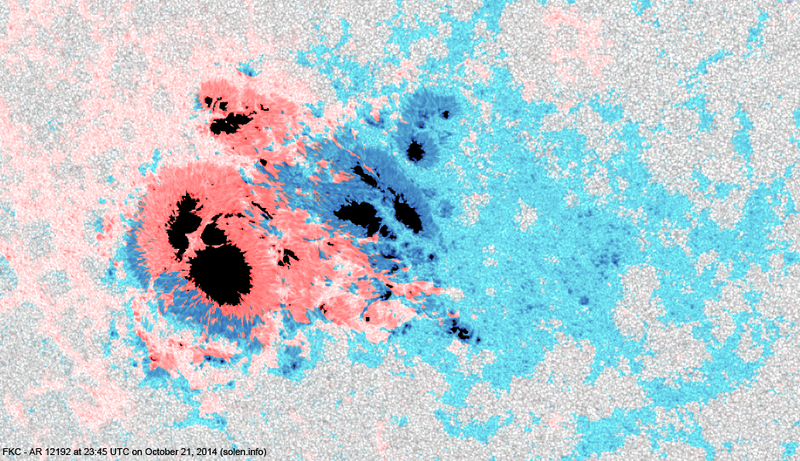 Region 12192 [S14E23] is still growing and has become the region with the largest area of any cycle 24 regions. There are multiple magnetic delta structures within the huge main penumbral structure (which spans nearly 10 degrees latitudinally and 13 degrees longitudinally). There's a moderate to high chance of a major (proton) flare until the region rotates out of view in 8-9 days time. 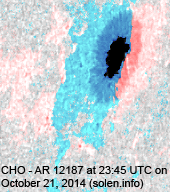 The region was the source of a major M8.7 long duration event peaking at 01:59 UTC on October 22 (at the time of writing there is no relevant imagery to determine if there was a CME associated with this event). 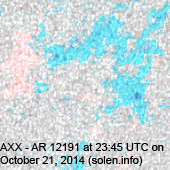 Region 12193 [N03W18] was quiet and stable. 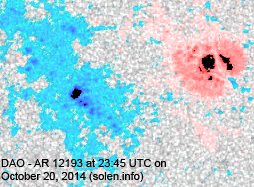 New region 12194 [S12E58] rotated into view on October 19 and was numbered by SPWC two days later. S3921 [N12E06] was quiet and stable. 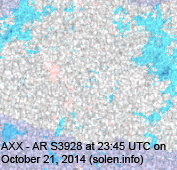 New region S3926 [N07E83] rotated partly into view. 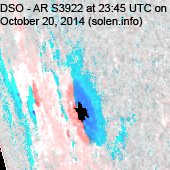 New region S3927 [S25W12] emerged with a penumbra spot. 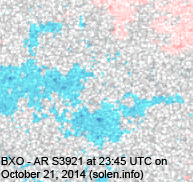 New region S3928 [S08W26] was observed with penumbra spots. 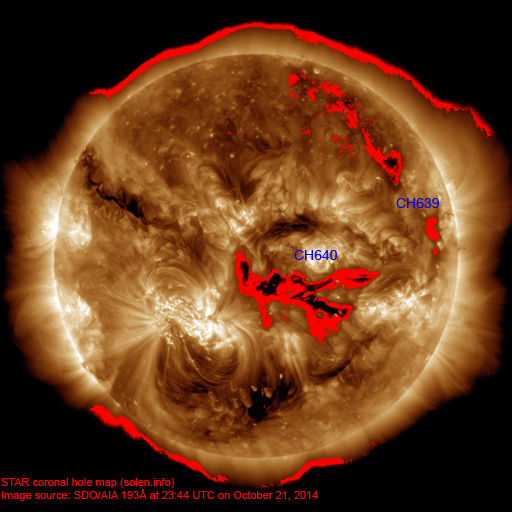 The geomagnetic field is expected to be quiet to active on October 22-24 due to effects from CH640.